This weekend I set myself the challenge of creating three new paintings for our home. Over the past week we have re-decorated our kitchen and it looks great in its new crisp green colour. With the decorating now done, we started to think about the decor and purchased three matching wood box frames together with some 10 x 12 cream mounts to compliment the frames and to co-ordinate with the walls. The wall that the paintings are for is in the dinning area at the far end of the kitchen, and are in a good place to view and yet away from the cooking etc, it is also well lit as it is adjacent to the patio doors. I tried out a few of my existing paintings but the kitchen needed something new, hence I came up with the idea of herbs, which I haven’t painting before and would fit nicely into a kitchen theme. 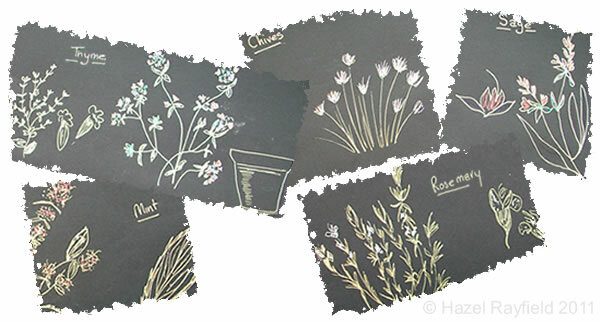 As flowers are my passion to paint, I started my research by looking at flowering herbs and decided on a few possibilities, I then sketched these very roughly. I don’t always draw my subjects before painting but it is good as a point of reference when creating a specific topic, I occasionally paint from photographs too, although 90% of my work is from my imagination. I think of my style of painting as impressionistic and not technical, when I sketch I use gel pens on mostly on black paper, not sure why exactly but it works for me and I like the way the gel pens flow. I have decided to show my sketches here in this post, just as an example of the process, they are only my guide and not to be considered too closely. Many people ask me how I get the detail into my wax paintings, this sketching part of the process helps as it reminds me of my ideas. Some of my paintings take time to paint and as I am not currently a full time artist I don’t always have the time to paint my ideas when I have them so making these quick sketches helps me recall what I imagined and want to paint. As you can see from my drawings I sketched several herbs and decided to paint, pots of Thyme, Chives and Sage, I also painted Mint but the result wasn’t to my taste! More of my paintings can be viewed online in the Art In Wax gallery, some are for sale and if you would like a floral piece commissioned please contact me.